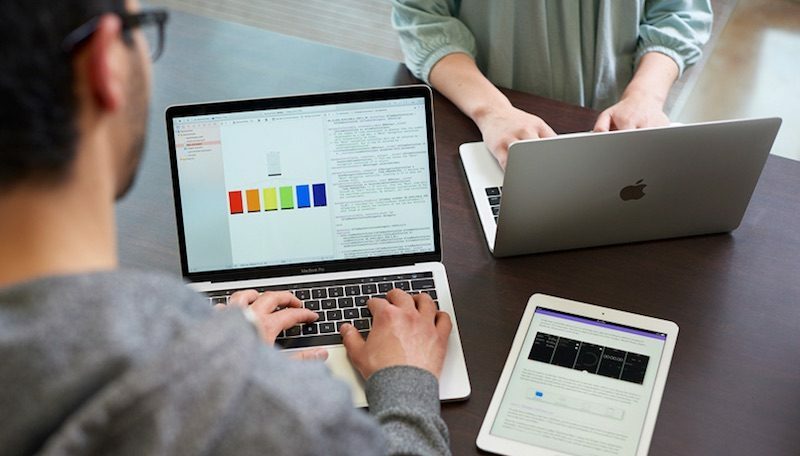 Apple today announced that its App Development with Swift curriculum will now be offered in more than 30 leading community college systems across the United States in the 2017-2018 school year. The full-year course, available for free on the iBooks store, teaches students how to build apps using Apple's open source programming language Swift. Apple says the course takes students with no programming experience and enables them to build fully-functional apps of their own design. The community college systems adopting the App Development with Swift curriculum in the fall include Austin Community College District, Northeast Mississippi Community College, Northwest Kansas Technical College, and additional campuses in the Alabama Community College System. Austin town mayor Steve Adler said Apple CEO Tim Cook is in Austin today. Cook will visit the Austin Community College District, meet with employees, and speak with local app developers at tech accelerator Capital Factory in downtown Austin, according to the Austin American-Statesman. They make it sound way to easy. Some people’s brains are wired for coding but a lot are not. If you’re someone who didn’t/doesn’t excel at math in school I think learning to code will be more difficult. I don’t think anyone can code. Programming is basically using the pattern recognition capacity of our brains. Which is something anybody can do. Of course some people can’t learn to program, can’t learn anything because it’s easier to turn off their brains and watch junk TV all day. I agree that not everyone can "get" coding, but there are TONS of people who are great at it, and have been successful, and haven't done math beyond high school basics. I know plenty myself. I have talked to people who are doing MSCS degrees, even at like GT, who say the degrees and crazy math are definitely not needed to code. Man I hope they still push teaching trades to people. So many trades colleges have closed us around here. Cant put plumbing or electrical in a building using swift! Thank goodness for Apple recognizing the important (vocational) role of US community colleges. I question the value of learning Swift. It is a platform unique language and closely tied to the Apple ecosystem. Great if you want to build Apple apps. Once you have the basics down, you can always add skills in platform specific tools and languages like Xcode and Swift. Yeah, I always tell people, you know, "the kids" :D who are interested in programming to learn core concepts, and learn how to implement those with a language outside of any kind of framework/DSL context. (A variant of this mantra is learn-the-language-not-the-framework). Immersing someone into the vast complexity of an IDE like XCode is tricky. The long tail certainly makes Apple billions. Millions of app developers paying $100 per year with 0 apps sold. I agree. So sad that the trades are kind of looked down upon in my community, yet many of them having starting salaries far above some 4-year college degrees. Bring back wood shop & car shop in high schools, as well as electrical & plumbing in college. I've heard stories about how these shop classes were the only thing some kids looked forward to at school. I've never written any code before but Swift looks fun so I'm going to have a go and create my own app. ... and we are thrilled to announce Xcode for iPad. Why does everyone need to learn to code? I’ll bet you most people who do programming for a living are good at math or it came easy to them in school. That’s been my experience with people I work with who code. I'll have to find the post, it was a very astute assessment of how learning some coding basics (maybe not specifically Swift and/or iOS) helps to build a better foundation for thinking skills like: analyzing a problem, defining a solution, application of logic, rule systems, debugging an issue. For people with an affinity for it, they get a start on a career path, for people who pursue other paths, they gain some knowledge that's applicable to all sorts of professions and life skills. Depending on your specific specialty-within-the-field, the math requirements can go from little-to-none to _extensive_ understanding of various math principles. Math requirement depends upon what you are building. If it is a simple app, then maybe not. If you are moving to something more advance, and higher paying, like ML or AI, definitely. I spent quite a bit of time reading math texts when I was getting my MS in CS, and I still do decades later.